Are you looking for engaging activities to help your students master dot plots, stem and leaf plots, and personal financial literacy? 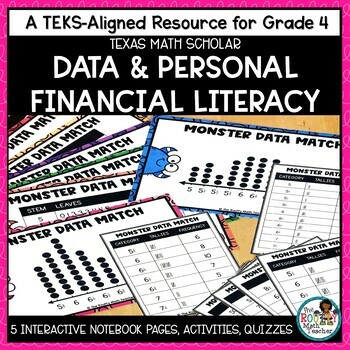 The skills in this pack are based on the TEKS for Reporting Category 4: Data and Analysis and Personal Financial Literacy. Each skill includes an interactive notebook activity with a communication through writing task, cooperative learning activity, and five-question formative assessment. Interested in the Texas Math Scholar Series? Check out these money-saving bundles! 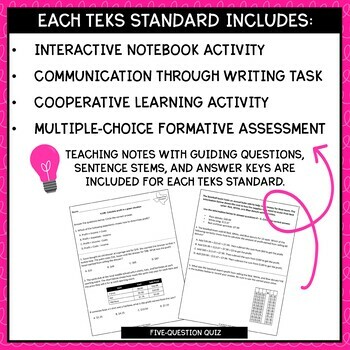 Click here to check out the Texas Math Scholar TEKS Activities Bundle for Grade 4. Texas Math Scholar is designed to support your students’ mastery of the new STAAR eligible TEKS through interactive notebook activities, cooperative learning, and assessment tools. The included learning materials can be used for review and/or intervention. In accordance with the new state assessment standards, the mathematical process standards are embedded throughout the learning materials to enhance the effectiveness of the tools. The learning activities may be used to support student learning of specific content in a whole class, small group, or intervention setting. Note: Activities and games are presented in color and as blackline masters for easy duplicating. The TEKS included in this pack are listed below. Want a sample of the pack to review first? Click here to download Texas Math Scholar: Understanding Place Value. Click here to check out Texas Math Scholar: Place Value and Rounding (RC 1). Click here to check out Texas Math Scholar: Fractions and Decimals (RC 1). Click here to check out Texas Math Scholar: Operations with Fractions and Decimals (RC 2). Click her to check out Texas Math Scholar: Operations with Whole Numbers (RC 2). Click here to check out Texas Math Scholar: Algebraic Reasoning (RC 2). Click here to check out Texas Math Scholar: Geometry (RC 3). Click here to check out Texas Math Scholar: Measurement (RC 3). Like this pack? Share it with others! Pin this pack on Pinterest so others will find it! Just click on the “Pin It” button on the left side of this page to share it with others! Keep up with The Routty Math Teacher! Be the first to learn about doing math The Routty Way. Become a follower of The Routty Math Teacher by clicking here or on the green star on any of my product pages and receive email updates in your TPT inbox. Did you know that you can build up TPT credit by leaving feedback on our products? You can submit feedback at the time of purchase or go to “My Purchases” for a list of what you have bought in the past. Next to each title is a “Leave Feedback” button. Click it and leave a rating and comment to receive the credit. Go to TPT Credits to learn how to redeem your credits on future purchases!